Goa has been one of the leading residential hubs of India since the last decade. Well, you might have known Goa for its beautiful beaches and sea, but demand for property in Revora, a popular locality in Goa, is on the rise. Goa is attracting homeowners from various parts of the country, thanks to its beautiful environment and enriched social infrastructure. Investors and homeowners are interested in investing in the projects in Revora. These residential complexes have been developed by the leading real-estate companies. The apartments come with the ideal mix of luxury and comfort. If you are looking for exotic properties in Revora, this is the best time for you to make your investment. A number of infrastructure projects have been carried out in the area in recent times. Upgraded roadways, faster connectivity and seamless transportation systems in the area have leveraged the quality of lifestyle to a great extent. The demand for property in the area is rising, and the prices of apartments are likely to increase in the coming months. You can cherish your housing dreams in the residential complexes in Goa. You can go for 2/3/4 BHK flats in Revora, loaded with a number if lifestyle and healthcare amenities. The apartments are sophisticated and come with spacious interiors. The elegant furnishings in the interiors will blow your mind. Besides, the residential complexes come with green living facilities. 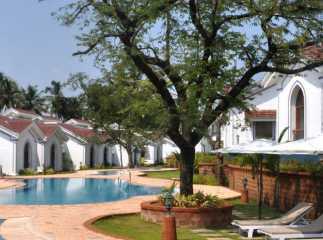 You can enjoy the landscaped gardens, vast open spaces and green patches with a large number of trees. When you move to the apartments in Revora, you can experience a refined lifestyle. An intelligent floor planning ensures optimum utility of space. A large area within the complex is dedicated for public use. You will enjoy your lifestyle when you get a luxurious home here. The well-developed transportation facilities in Goa ensure fast connectivity to the commercial areas. The plots in Revora are centrally located. You can get a quick reach to the places of entertainment and commercial zones. A number of shopping malls and multiplexes are located close to the residential complexes. Besides, the educational and healthcare infrastructure in the area is well-developed. You can buy luxurious villas in Revora. The important schools in the area include St Thomas High School, St Ann's Blooming Buds School, Don Bosco High School, Paradise School, St. Francis Xavier High School, Divine Mercy High School and St. Mary's Convent High School. You can book an apartment in the upcoming project Revora Goa now. The important hospitals in the area include Redkar Hospital and Research Center, Sunshine IVF Centre, Vision Multispecialty Hospital, Asilo Hospital, Mapusa District Hospital and Gauns Child Care Hospital. The residential complexes come with a large number of amenities. You can enjoy the swimming pool, gym, jogging tracks, cycling tracks, tennis court, clubhouse and various indoor and outdoor games in the complex. For investors and homeowners willing to buy property in Revora Goa, this is the right time to invest. The prices of property in the area are increasing. Experience a luxurious home, while you remain close to the commercial areas.